There has been a headache in iMessage activation that it does not activate properly or not activated at all. iMessage waiting for activation error on iOS 9 and below is becoming a big issue. 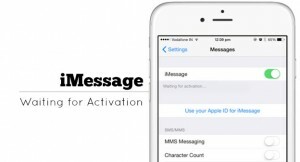 Are you tired of trying every single possible measures to fix imessage activation error? Well in this article I will guide you to how you can fix iMessage waiting for activation error on your iOS device. Apple is also concern about this issue and they will try not to make this mistake with the new iOS update>>Also Check Out this latest BiteSMS App for iOS(iPhone/iPad) Without Jailbreak. Before getting into detail make sure that you have the right information on your iPhone like your location GPS, phone number and email ID. There are several methods to fix this issue. So I will tell you about each and every method one by one. lets drag down your window to “Fix iMessage Waiting for Activation Error in iPhone”. Best Messenger: IMO for PC, Laptop on Windows 10/7/8 or Windows 8.1/XP/Mac. Contacting your Carrier customer service – Make sure that your carrier supports iMessgae. Contact them and verify all your details like your mobile number etc. Airplane Mode – This method can also work and can fix imessage error. First you need to turn off your imessage by going to the settings. Now turn ON the Airplane mode and also your wifi. Go back to the settings and turn ON iMessage. You’ll be prompted to add your apple ID. If you have already added your apple ID then this notification will not even show up. Now go back to the settings and turn off airplane mode. Your iPhone will get a notification saying “your carrier may charge for SMS”. Tap OK.
After few seconds or minutes your imessage will get activate without any issue or error. If you don’t get the notification you can turn OFF imessage again and then turn it ON again.You will get a number and a an email ID for confirmation later. Apple ID Sign-out, Sign-IN – Sometimes signing out and then siging up after a while can also fix this problem. Step 1 – Go to settings > Message and scroll down and you’ll see “send and receive” Tap on it.Step 2 – Now tap on the Apple ID and sign out. Step 3 – Turn of your iMessage service. Step 4 – Wait for a few minutes and then turn ON your Wifi and iMessage again. Step 5 – Go to the settings and go to Apple ID and sign in on your Apple ID again. This methods work for some people you can also try this method and who know it might work on yours. Reset or Restore – You can also reset your iPhone by rebooting your device. You can activate iMessage as a new. Enter your Apple ID after resetting your iPhone. Make sure that you have set your right location. Movies Apps Download: MegaBox HD Apk, Movie HD and ShowBox App. So these are the methods that which are most reliable and one them will definitely work on your iPhone and will fix iMessage waiting for activation error.